My sabbatical is long over, alas, but like any good project it has reverberations and influences that last well beyond the submission date. So I am going to keep this blog going, as a place to air thoughts as I learn more about climate science and its attendant implications for life on earth and for all our lives. I’m going to start with clouds, because they are beautiful and interesting and vital to us in many ways. They are also one of the important unknowns in climate science, as we’ll see below. As I learn about them, traveling dizzyingly across scales from my home base in quark physics (10-15 m) to cloud physics (10-7 m and beyond), I am going to use this blog as a repository for information and references. But I want to begin by acknowledging the place clouds have in human life and culture. Like most people raised in India, I associate clouds at the end of the relentless summer with the promise of the monsoons. Seeing the thunderheads piled high and dark in the sky before the first rain is an utterly thrilling experience that implies fields of plenty, food security, a cool respite from deadly heat, the washing away of summer dust, the world made anew. No wonder clouds are the subject of innumerable songs and dramas! In the ancient Sanskrit drama Meghadutam, by the poet Kalidasa, the central character is a cloud messenger that traverses the length and breadth of the country. Thinking of clouds today I ponder the mixed messages they are giving scientists with regard to their role in Earth’s warming climate. My Alaskan Case Study is Published! Last year, in the spring of 2014, I took my first sabbatical. I had just won a program award from the American Association of Colleges and Universities to complete an interdisciplinary case study on a real-world issue as a part of their STIRS (Scientific Thinking and Integrative Reasoning Skills) initiative. I wanted to do my project on Arctic Climate Change. So I took two intense online courses, called and emailed people who had apparently infinite patience and the requisite expertise, and ended up spending nearly ten days visiting Fairbanks, Barrow and Anchorage, Alaska. My last few posts are about that journey, which was, for me, life-changing. En route to Barrow, the Alaska Airlines flight stopped briefly at Deadhorse Junction. 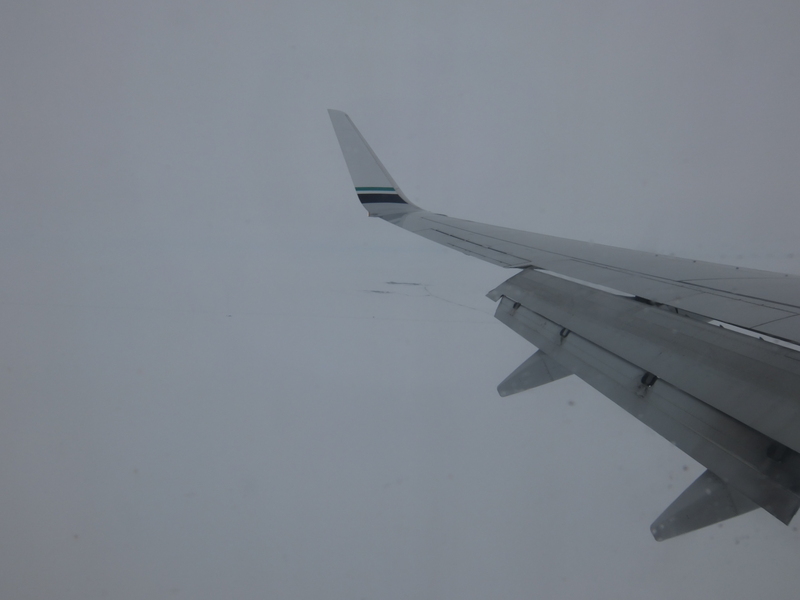 With my nose pressed to the window as the plane came gently down, I caught a glimpse of a vast, flat, white expanse of ice, with what looked like broken chunks scattered and pushed together to form pressure ridges. 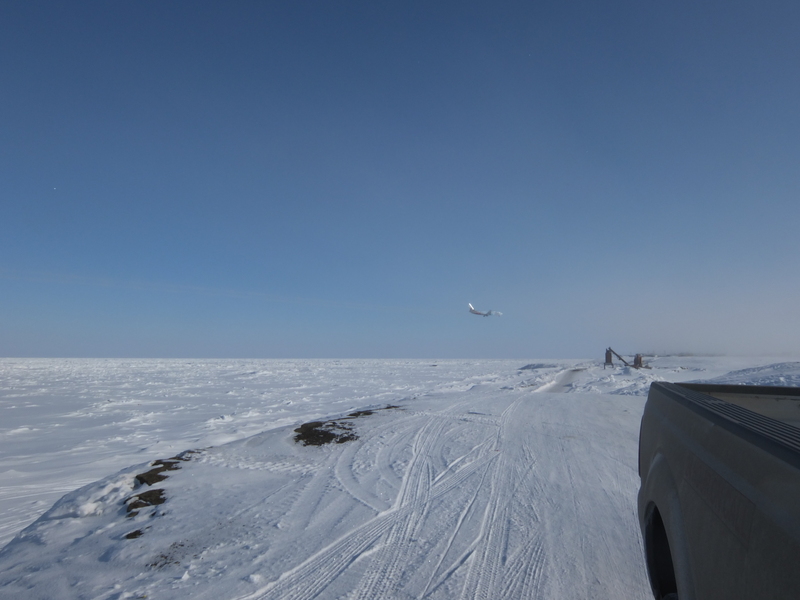 That was my first glimpse of the Arctic Ocean. Deadhorse Junction in the Prudhoe Bay oilfield lies in one of the centers of oil and gas onshore drilling. Judging from the passengers who got on the flight, this was man’s country – large men, all white as far as I could tell, with the Alyeska pipeline logo embroidered on their shirts. The airport was a large metal shed; the men walked to the plane across the snow, up a ladder and in, greeting each other. We got to Barrow barely an hour later. It was a flat, endless expanse of snow so bright it hurt the eyes, punctuated by the roofs of houses. As we landed I saw metal buildings and sheds; definitely a border outpost feel to the town. The one-room airport was packed; it took me some time to go past the desks and people, and find the small area where baggage was delivered. This, too, was crowded. There were a knot of people in coastguard uniforms talking earnestly with a large Iñupiaq man; there were natives and white people. No other people of color, and certainly no Asian Indians, a new experience for me! It took a while for the luggage to come. When it did, I called the hotel where I was staying, barely two blocks away. The temperature was a relatively temperate 13 degrees F, but a breeze was blowing. Not a day for a walk with heavy luggage. I was relieved when the taxi came and delivered me to the small inn. In the lobby I found myself face to face with a poster warning of polar bears. I was greeted with a friendly smile from the receptionist, who turned out to be Thai. Settling down into my room, which included kitchenette facilities, I pondered my situation. Here I was in a remote place where I knew nobody. I hadn’t heard back from the people I’d contacted. I’d been advised that Barrow was the kind of place where it is best to go see what happens, especially since I wasn’t part of any kind of official delegation. This is very similar to the go-with-the-flow, let’s-go-there-and-see-what-happens attitude I am familiar with in India. I just had to get into the spirit of adventure. 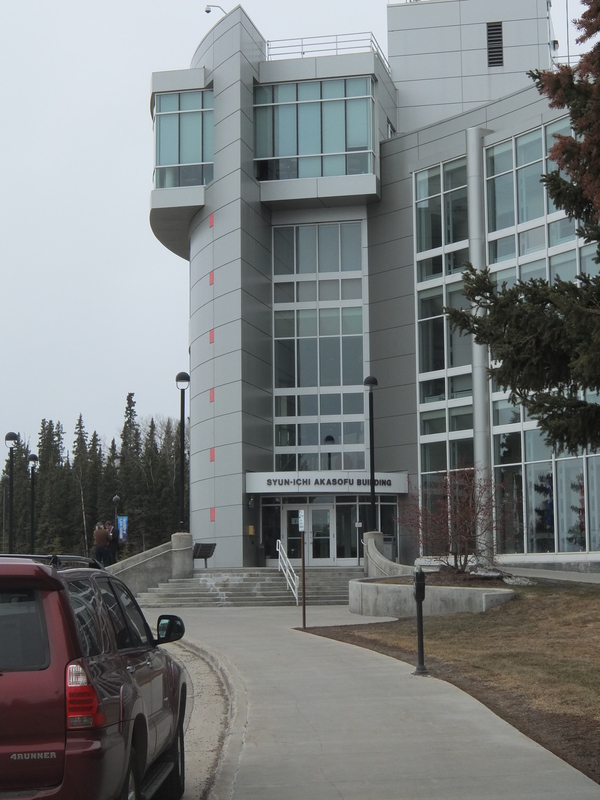 The University of Alaska at Fairbanks is on a high ridge overlooking the city. My cheerful host, a young researcher at the Geophysical Institute, told me about Fairbanks smog. Inefficient wood-burning stoves, diesel trucks and oil and gas industry exhalations all contribute to fine particulate matter in the atmosphere, which, along with a temperature inversion, produces a shawl of pollution that lies over the town. The university is rescued from this because it perches on a dramatically high ridge overlooking vast flatlands that are ringed by mountains. In the distance one can see craggy snow-capped peaks. Yet, walking on campus, I sometimes saw fine black dust on piles of snow by the sidewalk – perhaps the origin was local rather than the city proper. Atop one snowbank there were little rings of black dust surrounding small chunks of ice. The ice chunks lay on the snowbank like diamonds, each with its little ring. I thought perhaps the black dust had caused some snow to melt, and it froze overnight as ice, expelling the black dust into rings. Incidentally black carbon such as I’ve described above, when suspended in the atmosphere, is said to be the second largest contributor to global warming after carbon-dioxide. (The role of black carbon deposits on snow causing melting has been observed on a local scale (e.g surrounding a village) but its global role in ice melt is less certain). The Western end of the ridge on which the campus sits is occupied by scientific research buildings, which give way, as you go down the hill, to science departments and the arts and humanities. At the farthest Western end sits the new and shiny International Arctic Research Center, which is anatomically attached to the older Geophysical Institute. The IARC is named after its founding director, now emeritus, the eminent Dr. Syun-Ichi Akasofu, who is the leading expert on auroras. Outside his field his reputation is not great – he is a noted climate denier/ skeptic, unfortunately associated with the conservative Heartland Institute. It is a very odd thing that the IARC, an institute with a major focus on climate change research, should have been led by a denier. I asked one scientist working there what that was like, and got an embarrassed shrug. “But he’s a very nice man,” I was told. Well, why not? Climate deniers aren’t necessarily unpleasant people, even if they have a blinkered attitude toward data. Reporting from the small plane flying from Boston to Chicago, first leg of the journey to Fairbanks, Alaska: I’ve nearly finished reading a paper called “Gone the Bull of Winter?” by anthropologist Susan Crate (Current Anthropology, Vol. 49, Number 4, Auguest 2008). How a person with a background in theoretical particle physics ended up reading a paper in anthropology is a whole other story, but perhaps it is an example of how things ought to be. In the current era of the Anthropocene, physicists must rub shoulders, metaphorically speaking, with anthropologists, and with peoples of multiple backgrounds. One day I will finish consolidating my notes and bring you details of my climate change explorations in India. Apart from visiting family, in the cramped two weeks I had there, I spoke to (and in two cases attended seminars by) a number of people. Below are the highlights, followed by a story about a people who decided to ask a profound question at the heart of the climate change issue. Alas, time has become a frenemy, as my students might put it. One the one hand, I have been having a marvelous time, rich with learning and enhanced by travels and conversations with a number of people. On the other, this means that I have less time to keep this blog updated. I am several posts behind — I’ve finished the UCSD Climate Change course (a wonderful experience), am halfway through Dynamics and Chaos, and am considering taking another course, although I’ll have catching up to do. From my brief sojourn in India I have at least four posts to write, summarizing conversations with science and policy people as well as activists and educators about climate change from an Indian perspective. Soon I will be off to another trip — more learning and experiencing — in a place where climate change is happening at an accelerated pace — Alaska! — of which more anon. I am reading massive tomes on everything from Arctic geology to history to native cultures, and if I can come up for air, I will post a book review or two. I appreciate the patience of those following this blog. I will try to keep posts short and more frequent.